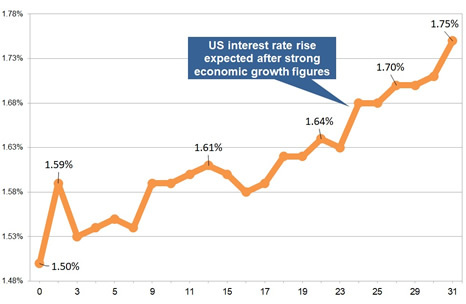 The 15-year gilt yields are up 25 basis points for the start of the year as US interest rates are expected to rise in March after strong economic growth figures and rallying markets. 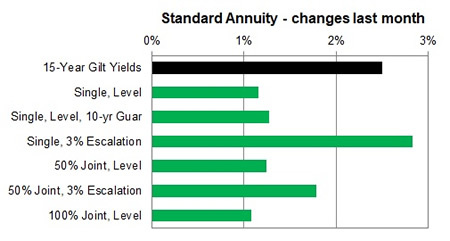 The 15-year gilt yield are up 25 basis point to 1.75% during January 2018 with providers of standard annuities increasing rates by 1.54% for this month and we would expect rates to rise by a further 0.96% in the short term. 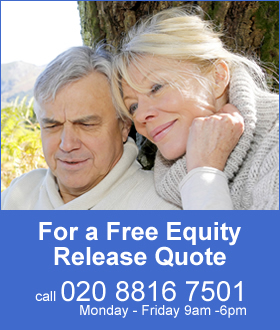 For smoker and enhanced annuity providers have increased their rates by an average of 0.68% and rates may rise by a further 1.82% in the short term. 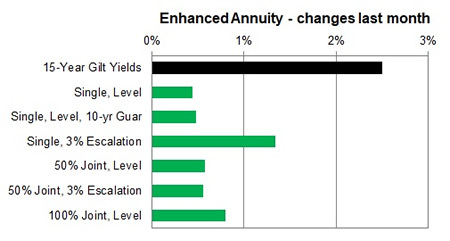 Standard annuities increased by an average of 1.54%% during the month. The largest rise was for those aged 70 based on single and joint life for both level and escalating rates up by as much as 5.73% for the month. The largest decrease was for those aged 75 on a 50% joint life basis down by -1.27% for the month. For enhanced and smoker the majority of rates increased by 0.68% for the month on average. The largest rise was for those aged 60 to 70 on a single life, 3% escalation the rates up by 2.50% whereas the largest fall was for those aged 55 on a 50% joint life, 3% escalating basis down by -4.00%.